Wanna make a bet? I’ve never agreed with that saying. For anyone who has been bullied before, words can do more damage than a machine gun. Words have more power in the material world than we think. Japanese researcher Dr. Masaru Emoto revolutionized how we think about the energy of words when he published his work on how water crystals react to certain terms, photography or music. I’m beginning to see a pattern here, are you? Darmouth College’s Geoff Kaufman teamed up with Lisa Libby at Ohio State University to prove that literature can truly have a profound impact on our self-understanding, attitudes and even behaviors. In the Journal of Personality and Social Psychology (Vol. 103, No. 1, 1-19, 2012), they report on the phenomenon they’ve termed “experience-taking“. Essentially, you take on the fictional character’s experience as your own. The neat thing is our brains can’t distinguish between reading about an experience and actually encountering it in real life, which is maybe why the more teary-eyed folks among us cry so easily when reading a good book or seeing a good movie (I am one of them. I admit. You know that scene in Spielberg’s 2011 flick, War Horse, where the British and the German soldiers gather together in no-man’s land to free the horse from the barbed wire fence in a momentary act of peace and purpose? Yea, I was bawling, people. Bawling I was!). If a book is good, I cry at the end too. It’s that empathy thing, like saying goodbye to a dear friend you won’t see for a long, long time. Because in your mind, you are. Those characters are real, dammit! Who needs reality TV when you can enter a fantasy world by opening a book at any time? If you have ever written fiction, you will know that those characters come knocking at your door at all hours of the night, wanting to be heard, formed and plopped into the storyline of your own creation. They can be pretty adament, too. I have a few slumbering in my head myself. Maybe I’ll let them out to play on the page a little more. And when I do, you’ll get to be a part of the fantasy too. For now, I offer you this three-minute video to illustrate the power of words. May you choose yours carefully and with all the kindness you possess. What’s today? Not just Pearl Harbor Day. No, no! Today is the day you can join me, Shirley MacLaine, my smiling turtle and many others to receive a ton of bonus prizes when you purchase a copy of The Power of Slow. Who is the smiling turtle? He’s the product of my brilliant Webmaster who put together this site www.powerofslowbook.com just for you. Go visit him. He’s a hoot! 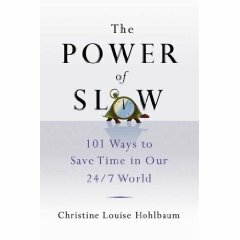 Go to www.powerofslowbook.com. Purchase a copy of The Power of Slow (‘Step 1’), put in your amazon order confirmation # by clicking on ‘Step 2’ and receive a free month membership to Shirley MacLaine’s site along with dozens of other gifts from best-selling authors such as Mike Robbins, Stever Robbins, Arielle Ford and more! I would welcome your participation. Give yourself and others the gift of time this holiday season!